Since the canvas is part of the HTML page, you can position things above or below it. You clicked on: …nothing yet! For the example above, I've replaced all the links with onclick handlers so that you won't end up on a different page when you click on any of the tags. Note again: the fading of image tags with distance does not work with the current version of Explorer Canvas. I've created a modified version of excanvas.js to make it work, which you can get from here. If you don't use image tags, or don't want images to fade with distance, then you should use the latest version from the Google code site linked above. TagCanvas 1.3 was the first version to support image links - the first image found inside a link will be used instead of any text. 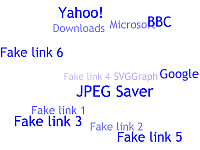 Click the "Use image links" button below the example tag cloud above to see it in action. If you're using a laptop with a new-ish browser, take a look at the accelerometer page to see what happens when I find out hardware I didn't know I had is accessible from a browser. Starting in version 1.6 TagCanvas supports weighting of tags. Take a look at the TagCanvas with weighted tags page for more details and an example. Two more examples side-by-side. Clicking a tag in the first will reload the second with different content. The TagCanvas script is available as a stand-alone version and as a jQuery plugin. Both are available as full source and minified versions in the table below. Unless you intend to modify the code of the TagCanvas script, you should use the minified version of the script - the minified versions are around 30% smaller than the uncompressed versions. The minified versions of the files have been compressed using the Yahoo! YUI Compressor. Download my modified version of Explorer Canvas here: excanvas.zip. The original source of Explorer Canvas is on the Google code site. Some developers have managed to do more with TagCanvas, so I'm happy to link to their work here. If you know of any other projects that use TagCanvas, please let me know and I'll add them to the list. As usual, this code doesn't come with any guarantees. But if you get stuck, find any bugs or have suggestions for improvements, please contact me at the usual address, graham(at)goat1000.com.